If religion is a part of your family or school life it can be a valuable source of language for children. Teaching faith strengthens language skills because it is an integral part of daily life. In addition, it taps into music, stories, routine, and repetition. Below you will find a variety of short Spanish prayers for kids. Prayers, like poetry, are often memorized and recited. Be sure to check out our poetry resource page Spanish Poems for Kids. It has poems for children and information about sharing them with language learners. Prayer can be an important part of daily routine. In addition, mealtime prayers in Spanish and bedtime prayers in Spanish are rich language experiences. Of course, you will adapt Spanish prayers for kids to your family and or class. Below you’ll find prayers to use as they are or adapt to make more relevant and personal. 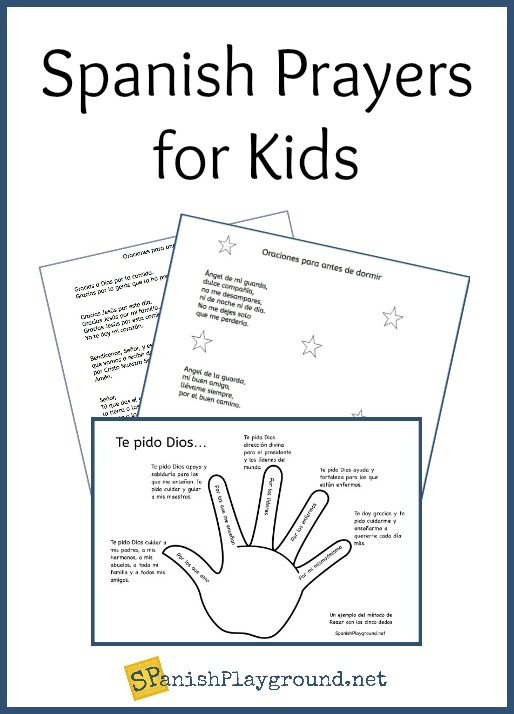 There are also printable pages of the mealtime and bedtime prayers in Spanish. Thank you to all the teachers and parents who shared their prayers with me! You may also want to check out these resources for telling the Christmas story in Spanish. Mealtime prayers in Spanish teach gratitude and language related to food and family. Gracias a Dios por la comida. Gracias por la gente que la ha preparado. Gracias Jesús por este día. Gracias Jesús por mi familia. Gracias Jesús por esta comida. Yo te doy mi corazón. Bendice las manos que los hicieron. Niñito Jesús, nacido en Belén. y bendice las manitas que los prepararon. que por Tu bondad vamos a tomar. Bendice a las personas que los prepararon. y danos hambre de Tí a los que tenemos pan. y por las manos que los prepararon. o guíanos a ellos para ofrecerles de nuestro pan. Download a printable page of the mealtime prayers in Spanish: Oraciones para antes de comer. Bedtime prayers in Spanish are another routine that naturally incorporate language. One of first bedtime prayers many children learn is the Guardian Angel prayer in Spanish, Ángel de mi guarda. There are several versions. Señor, gracias por este día que termina. Todo lo que pude hacer te lo debo a ti. mañana lo lograré si es tu voluntad. The 5-finger prayer, or la oración de los cinco dedos, is a simple method to help children remember who to include in their bedtime prayers. Many attribute the Rezar con los cinco dedos method to Pope Francis when he was Archbishop of Buenos Aires, and many churches have adopted it. The thumb is the closest finger to you. Start praying for those who are closest to you, the people you love. Next is the index finger. Pray for the people who teach you. They need support and wisdom to guide others. The next finger is the tallest. It reminds you of leaders and people with authority. They need God’s guidance. The fourth finger, the ring finger, is the weakest finger. It reminds you to pray for the weak, the sick or those troubled by problems. Last is the smallest finger. The smallest finger reminds you to pray for yourself. Because you have already prayed for others, you see your own needs in perspective. The 5-finger prayer provides a structure children can personalize. It reminds them to pray for their family and friends and also helps them to think beyond their immediate circle. Of course, the language in the 5-finger prayer in Spanish will vary. I’m sharing a printable page as an example of the language your child might use. I made this example with young language learners in mind. Download 3 Bedtime prayers in Spanish: Oraciones para antes de dormir. Download 5-finger prayer example: Ejemplo del método de rezar con los cinco dedos. Are Spanish prayers for kids a part of your family or school life? If you have favorite prayers you say with children, please share them in the comments below.